They keep popping up. This looks like a very nice specimen to me. Adding it here for the records and to see for how much it will go. But also due to the mention of the first ownership which remarkably seems to be a lady. I couldnt find much more detail about her. 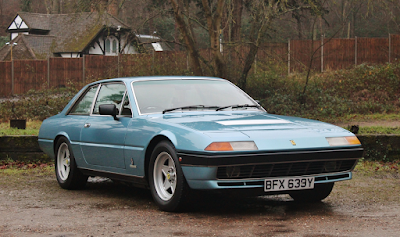 This 1982 Ferrari 400 GTi, one of only 25 manual UK-market, right-hand drive cars, was supplied through Emblem Sports cars on 9th November 1982 to its first owner, a Mrs A. Fournier of Poole, Dorset. Finished in a delightful shade of Azzurro Metallica with Beige/Sky Blue hide, the car was specified with Royal Blue carpets along with desirable rear air-conditioning - a £710 option from new! After a couple of years of ownership, the Ferrari was sold to a Mr J.D Lawrence who kept it until 2004 when it was purchased by a Mr J. Connell.